AKA Sir William Ramsay, Jr.
British chemist William Ramsay discovered a previously unknown class of inert, rare, or noble gases. He studied under Robert Wilhelm Bunsen, and predicted that dense gasses were hidden, invisible and as yet undetected in the Earth's atmosphere. To test his idea, he designed an experimental means to remove oxygen and nitrogen from the air, and analyzing what remained in collaboration with Lord Rayleigh he found the previously unknown element argon (Ar) in 1894. He later spectroscopically confirmed the existence of helium, which had first been observed by Pierre Janssen. From the established positions of argon and helium on the periodic table of elements, Ramsay guessed that more unknown gasses exist, and discovered krypton, neon, and xenon in 1898. 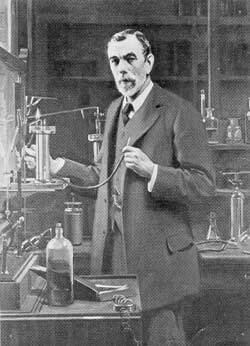 Working with chemist Robert Whytlaw-Gray (1877-1958) he discovered radon in 1900. In 1903, working with Frederick Soddy, Ramsay showed that the radioactive decay of radium produces helium, a discovery which laid the groundwork for the subsequent development of nuclear physics. In 1904 he was awarded the Nobel Prize in Chemistry, while his colleague Rayleigh won the Nobel Prize in Physics in the same year.